The Statue of Liberty is a colossal neoclassical sculpture on Liberty Island in New York Harbor, designed by Frédéric Bartholdi and dedicated on October 28, 1886. The statue, a gift to the United States from the people of France, is of a robed female figure representing Libertas, the Roman goddess of freedom and the embodiment of liberty, who bears a torch and a tabula ansata (a tablet evoking the law) upon which is inscribed the date of the American Declaration of Independence, July 4, 1776. A broken chain lies at her feet. The statue is an icon of freedom and of the United States. a welcoming signal to immigrants arriving from abroad. In 238 B.C., before the Second Punic War, having long been a Roman deity along with other personified virtues, Libertas assumed goddess status. Tiberius Gracchus ordered the construction of her first temple on Aventine Hill; census tables were stored inside the temple’s atrium. A subsequent temple was built (58-57 B.C.) on Palatine Hill, another of the Seven hills of Rome, by Publius Clodius Pulcher. By building and consecrating the temple on the former house of then-exiled Cicero, Clodius ensured that the land was legally uninhabitable. Upon his return, Cicero successfully argued that the consecration was invalid and thus managed to reclaim the land and destroy the temple. In 46 B.C., the Roman Senate voted to build and dedicate a shrine to Libertas in recognition of Julius Caesar, but no temple was built; instead, a small statue of the goddess stood in the Roman Forum. Libertas, along with other Roman goddesses, has served as the inspiration for many modern-day symbols, including the Statue of Liberty on Liberty Island in the United States of America. According to the National Park Service, the Statue’s Roman robe is the main feature that invokes Libertas and the symbol of Liberty from which the Statue derives its name. In addition, money throughout history has born the name or image of Libertas. Libertas was pictured on Galba’s “Freedom of the People” coins during his short reign after the death of Nero. The University of North Carolina records two instances of private banks in its state depicting Libertas on their banknotes; Libertas is depicted on the 5, 10 and 20 Rappen denomination coins of Switzerland. Denarius (42 BC) issued by Cassius Longinus and Lentulus Spinther, depicting the crowned head of Libertas, with a sacrificial jug and lituus on the reverse. Libertas is depicted on coins from several countries, such as the centime coins of the Swiss franc depicted below. There are several plaques and dedicatory tablets on or near the Statue of Liberty. A plaque on the copper just under the figure in front declares that it is a colossal statue representing Liberty, designed by Bartholdi and built by the Paris firm of Gaget, Gauthier et Cie (Cie is the French abbreviation analogous to Co.). A presentation tablet, also bearing Bartholdi’s name, declares the statue to be a gift from the people of the Republic of France that honors “the Alliance of the two Nations in achieving the Independence of the United States of America and attests their abiding friendship.” There is a tablet placed by the New York committee that commemorates the fundraising done to build the pedestal. The cornerstone also bears a plaque placed by the Freemasons. Among the Romans the cap of felt was the emblem of liberty. When a slave obtained his freedom he had his head shaved, and wore instead of his hair an undyed pileus. Hence the phrase ‘servos ad pileum vocare’ is a summons to liberty, by which slaves were frequently called upon to take up arms with a promise of liberty. The figure of Liberty on some of the coins of Antoninus Pius, struck A.D. 145, holds this cap in the right hand. The master brought his slave before the magistratus, and stated the grounds (causa) of the intended manumission. The lictor of the magistratus laid a rod (festuca) on the head of the slave, accompanied with certain formal words, in which he declared that he was a free man ex Jure Quiritium, that is, “vindicavit in libertatem.” The master in the meantime held the slave, and after he had pronounced the words “hunc hominem liberum volo,” he turned him round (momento turbinis exit Marcus Dama, Persius, Sat. V.78) and let him go (emisit e manu, or misit manu, Plaut. Capt. II.3.48), whence the general name of the act of manumission. The magistratus then declared him to be free. 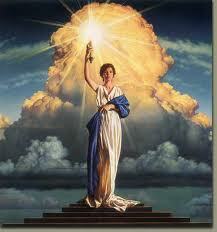 Columbia Pictures, named in 1924, uses a version of the personified Columbia as its logo. The fictional characters Columbia of the United States of America and Marianne of France, the Statue of Liberty in New York Harbor and many other characters and concepts of the modern age were created as, and are seen, as embodiments of Libertas. The design, posture and dimensions of the Statue of Liberty in New York Harbor are based on what the Colossus was thought by engineers in the late 19th century to have looked like. 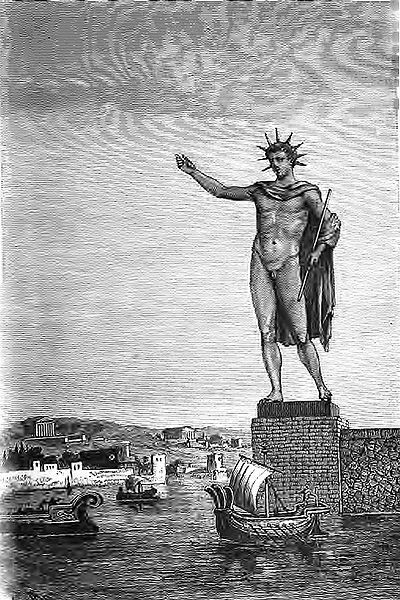 The Colossus of Rhodes depicted in 1880. The Colossus of Rhodes was a statue of the Greek Titan Helios, erected in the city of Rhodes on the Greek island of Rhodes by Chares of Lindos between 292 and 280 B.C. It is considered one of the Seven Wonders of the Ancient World. It was constructed to celebrate Rhodes’ victory over the ruler of Cyprus, Antigonus I Monophthalmus, whose son unsuccessfully besieged Rhodes in 305 B.C. Before its destruction in 226 B.C.—due to an earthquake—the Colossus of Rhodes stood over 30 meters (107 ft) high, making it one of the tallest statues of the ancient world. There is a famous reference to the Colossus in the sonnet “The New Colossus” by Emma Lazarus, written in 1883 and inscribed on a plaque located inside the pedestal of the Statue of Liberty. Emma Lazarus (July 22, 1849 – November 19, 1887) was an American poet born in New York City. She is best known for “The New Colossus“, a sonnet written in 1883; its lines appear on a bronze plaque in the pedestal of the Statue of Liberty placed in 1903. The sonnet was written for and donated to an auction, conducted by the “Art Loan Fund Exhibition in Aid of the Bartholdi Pedestal Fund for the Statue of Liberty” to raise funds to build the pedestal. Lazarus’ close friend Rose Hawthorne Lathrop was inspired by “The New Colossus” to found the Dominican Sisters of Hawthorne. Minerva was the name of a deity invoked during Aleister Crowley‘s occultic rituals. Minerva was the virgin goddess of poetry, medicine, wisdom, commerce, weaving, crafts, and magick. Mother Nature (Mother Earth) is referred to as Ishtar (Easter)” which is the name of the Babylonian “Mother of Harlots,” and her image stands as the sun-goddess “Lady Liberty” in New York Harbor. This Colossus statue even has the “tower” headpiece, as seen worn by Artemis. The Hebrew Tanakh (Old Testament) calls her Asherah (which is a pagan god with origins in Babylon and Egypt. The Torah says “When the LORD your God cuts off before you the nations whom you go in to dispossess, and you dispossess them and dwell in their land, take care that you be not ensnared to follow them, after they have been destroyed before you, and that you do not inquire about their gods, saying, ‘How did these nations serve their gods?–that I also may do the same.’ You shall not worship the LORD your God in that way, for every abominable thing that the LORD hates they have done for their gods, for they even burn their sons and their daughters in the fire to their gods. “Everything that I command you, you shall be careful to do. You shall not add to it or take from it” (Deuteronomy 12:29-32 ESV). King Solomon wrote, “If my people, which are called by my name, shall humble themselves, and pray, and seek my face, and turn from their wicked ways; then will I hear from heaven, and will forgive their sin, and will heal their land. The Torah states that we are to , “These are the statutes and rules that you shall be careful to do in the land that the LORD, the God of your fathers, has given you to possess, all the days that you live on the earth. You shall surely destroy all the places where the nations whom you shall dispossess served their gods, on the high mountains and on the hills and under every green tree. You shall tear down their altars and dash in pieces their pillars and burn their Asherim with fire. You shall chop down the carved images of their gods and destroy their name out of that place. You shall not worship the LORD your God in that way. Scripture commandments clearly tell us to destroy the places where pagans and curls worship. I think I will just sit here and read my Bible. Saint Timothy wrote, You then, my child, be strengthened by the grace that is in Christ Jesus, and what you have heard from me in the presence of many witnesses entrust to faithful men who will be able to teach others also. Share in suffering as a good soldier of Christ Jesus. No soldier gets entangled in civilian pursuits, since his aim is to please the one who enlisted him. An athlete is not crowned unless he competes according to the rules. It is the hard-working farmer who ought to have the first share of the crops. Think over what I say, for the Lord will give you understanding in everything. Remember Jesus Christ, risen from the dead, the offspring of David, as preached in my gospel, for which I am suffering, bound with chains as a criminal. But the word of God is not bound! Therefore I endure everything for the sake of the elect, that they also may obtain the salvation that is in Christ Jesus with eternal glory. The saying is trustworthy, for: If we have died with him, we will also live with him; if we endure, we will also reign with him; if we deny him, he also will deny us; if we are faithless, he remains faithful– for he cannot deny himself. Remind them of these things, and charge them before God not to quarrel about words, which does no good, but only ruins the hearers. Do your best to present yourself to God as one approved, a worker who has no need to be ashamed, rightly handling the word of truth. But avoid irreverent babble, for it will lead people into more and more ungodliness, and their talk will spread like gangrene. Among them are Hymenaeus and Philetus, who have swerved from the truth, saying that the resurrection has already happened. They are upsetting the faith of some. But God’s firm foundation stands, bearing this seal: “The Lord knows those who are his,” and, “Let everyone who names the name of the Lord depart from iniquity.” Now in a great house there are not only vessels of gold and silver but also of wood and clay, some for honorable use, some for dishonorable. Therefore, if anyone cleanses himself from what is dishonorable, he will be a vessel for honorable use, set apart as holy, useful to the master of the house, ready for every good work. So flee youthful passions and pursue righteousness, faith, love, and peace, along with those who call on the Lord from a pure heart. Have nothing to do with foolish, ignorant controversies; you know that they breed quarrels. And the Lord’s servant must not be quarrelsome but kind to everyone, able to teach, patiently enduring evil, correcting his opponents with gentleness. God may perhaps grant them repentance leading to a knowledge of the truth, and they may come to their senses and escape from the snare of the devil, after being captured by him to do his will. The largest and clearest prohibition cinverning statues was given by God (YHWH) in the Book of Deuteronimy when he said, “And God spoke all these words, saying, “I am the LORD your God, who brought you out of the land of Egypt, out of the house of slavery. “You shall have no other gods before me. “You shall not make for yourself a carved image, or any likeness of anything that is in heaven above, or that is in the earth beneath, or that is in the water under the earth. You shall not bow down to them or serve them, for I the LORD your God am a jealous God, visiting the iniquity of the fathers on the children to the third and the fourth generation of those who hate me, but showing steadfast love to thousands of those who love me and keep my commandments. Our minds need to be centered on the blessed hope of Salvation and the Second Coming od Yeshua HaMashiach. Life is to short to quarrel with everyone for any reason. Shalom!